Intersection of worlds, the multiplication of potential, maximum strength with minimum effort, facing forward, forgetting what is behind, different from what you knew, low speed excitement. What if the X is a real dirt and smaller, more motocross version of the Scrambler? Although the letter X would make sense in that case, I don’t think this is it based on the video. What if X means cross-over, a word commonly used in Europe, well, at least in Italy, to define motorcycles whose abilities cross over two purposes, like the adventure-inspired sport-tourers? The Multistrada is one of these bikes already, and it was just last year that it was updated with its DVT motor, so we know that is not it. There is talk about an enduro version for the Multistrada. That shouldn’t be the X, though, it would still have an emphasis on fast. What about the new Hyperstrada that has been rumored, which will be a 939 (or 937, or 959 or anything sexier than 1,000 as is Ducati’s way of doing things) based on a new motor, and if instead of Hyperstrada it would be called something new, a “cross-over” motorcycle? No, I’m not convinced that would be the “X” either. Neither of these possible bikes would fit a “low speed excitement” situation. I just tested and reviewed the MV Agusta Turismo Veloce, a bike that represents a new frontier for MV Agusta, entering the growing market of adventure-inspired sport tourers, and the final result is a motorcycle better than most other bikes in the sector. Why can’t Ducati enter, for example, the cruiser market, the largest market in the United States, a growing market in the world, and deliver the goods in low speed excitement form? Yes, that’s our guess, a cruiser or cross between a cruiser and something else. The Diavel comes to mind as a starting platform, with spy photos telling a story. 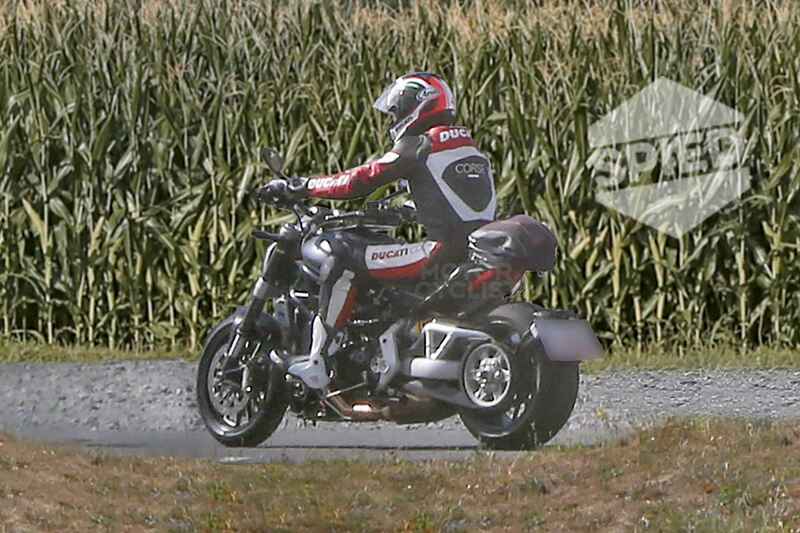 Spy photos of what seems to be the next Diavel for 2016. Black, X, or something else? The Ducati Diavel has been a motorcycle that came out of the mind of one of Ducati’s designers, went from concept to leadership, and from there into reality. The Diavel was not the result of a carefully discussed marketing plot to specifically enter or create a new motorcycle segment. It was born in limbo, it stayed in limbo. Then it had a half-attempt at becoming something else with its Strada version. People called it power cruiser, muscle bike, and who knows what else, and journalists never quite knew against what bike to pitch it in their magazine comparison articles. Perhaps now it is time for Ducati to try something new with or from its Diavel idea. Move footpegs forward, add a belt drive, change the engine nature, reposition and make the exhaust sound different, and maybe Ducati moves the Diavel idea one step closer to a cruiser, not quite there, just a cross-over tourer/cruiser. The X? Lastly, add to this idea the DVT motor. While new Multistrada owners complain the motor has lost its mid-range punch in its DVT version (the torque curve looks like Mt St Helen after the eruption), the DVT motor has a very stable operation at low RPM range (and I hear a nice power surge after 6,5k RPM). Ah… there we go, low speed excitement. Cruiser ergonomics, big motor, L-twin exhaust sounds, low RPM motor stability… something new from Ducati, low speed excitement! As mentioned earlier, Ducati also has a video called “this is Black”, so the Diavel-cruiser on the photos above could be the “black”. This new X bike could be something completely different, even more cruiser-like than the spy photos above indicate. The black and the X could also be variations on the theme, the same motorcycle in different trim. I’ll go out on a limb and say, despite low speed excitement, this new bike will probably have a fast side to it if it uses the 1200cc DVT motor. The X would be the cross between slow and fast worlds. Who knows… There are two other videos yet to be released in this marketing campaign. We will know about all of this soon enough on November 16th, if not earlier. As I always say, the more motorcycle options there are, the better for us in the riding community. This entry was posted in Bike Reviews and tagged Ducati 2016, Ducati Black, Ducati World Premiere, Ducati X, this is X. Bookmark the permalink.